A couple of days ago I’d stepped out into the front yard to hang out a few items to dry, and as I was standing there I was passed by a large, fluttering shape. It took me a few moments to register what it was. It fluttered rather like a butterfly, but the creature seemed to be carrying something. When it came round and passed by me again I realized that it was, in fact, a butterfly, and it was indeed carrying something. 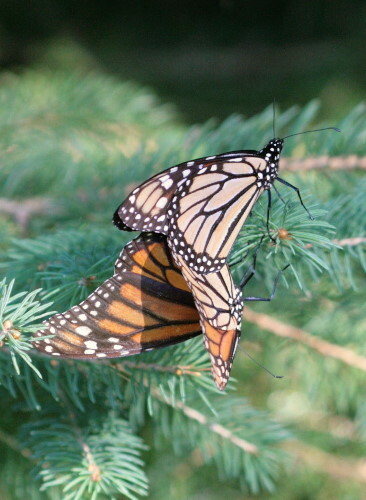 It was a pair of Monarchs, locked in copulation. The male was fluttering about while the female dangled below him, her wings folded as he flew so as not to interfere. I watched them for a bit, and after a couple of loops around the yard they finally settled low on the spruce tree, and I dashed for my camera. I have noticed several Monarchs already this summer, though this is the first mating pair I’ve seen. I’ve been delighted by their abundance. 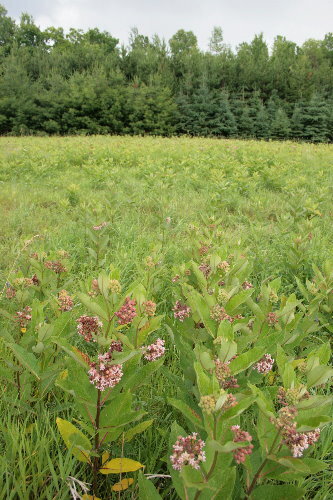 Our fields here around the house are stuffed with milkweed, the greatest density of the plant that I’ve seen anywhere. On a warm summer evening, with a light breeze blowing through the flowers, the deliciously sweet scent is almost heady. Last summer, when we’d first moved in, I’d regarded those fields with great anticipation of the abundance of Monarch butterflies that we would have, and, especially, Monarch caterpillars, which I had never seen. If I was exceptionally lucky, perhaps we’d even find a chrysalis. But all last summer I saw only two or three individuals. I found only a single caterpillar. The fact that I’ve seen better numbers this year is encouraging to me, especially since reports out of the south after this winter suggested that the Monarch population really took a hit this year due to severe weather and threats from deforestation, and might even be at the lowest levels in over three decades, with the overwintering masses filling only a quarter of their usual acreage. And as if that weren’t enough of a challenge, increases in recent years in the use of herbicides in agriculture here in North America, eliminating milkweed from fields and reducing the amount of hostplant available to monarchs, might also have an effect on populations. I am sure that over the long history that Monarchs have been wintering in these restricted areas of Mexico this isn’t the first year that they’ve been affected by storms and other weather phenomena that have hammered populations. The difference is that ordinarily they could bounce quickly back because that was the only challenge that faced them. Now they’ve got habitat loss through development and herbicides with which to contend, and whether they recover or not is as much up to us as it is to nature herself. They have a safe haven here, at least, a veritable milkweed paradise. They’re a great passion of mine. I’m glad to hear their numbers seem better this year, especially after the terrible winter they had. I know the migratory count in spring showed a severe drop. We’ve been seeing great numbers this year, too! Very exciting! Very cool to see a pair like that. I’ve noticed just generally that there is much more milkweed in eastern Ontario than in the GTA. I have seen quite a few this year also…nice picture…and thanks for helping with the bug ID. We have a lot of milkweed in our area but I have seen very few Monarchs. Last year we had a gazillion of them. I wonder if it is a result of our -out of the ordinary winter – with 3 months of snowcover (unheard of for our area). I do hope I start seeing them soon. A hopeful post. I have been photographing native plants in south-central and eastern Ontario for the last few months, and although I see lots of milkweed, only two monarchs, no snacked-on milkweeds, and no eggs–but I did not look at every single milkweed. Here’s hoping I have just been looking through my camera lens when a zillion monarchs waltzed by me. Was in Virginia earlier this month and there were monarch caterpillars on about a quarter of the plants I checked. They weren’t too big yet (I would guess 2nd or 3rd instar… but don’t really know enough to tell). I had been wanting to show one to the kids (the caterpillars, that is). Been looking for a spicebush cat too. Have enjoyed your blog off and on for awhile.